Now you can edit your digital photos and graphics very easy and comfortable with this innovative Photo Editing Program “FotoWorks XL 2”. The extensive functions for image editing are arranged in a very clear menu structure and for better control you can see always the original picture and the edited version of your pics! 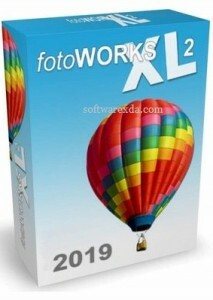 Fotoworks XL 2 is particularly suitable for beginners of all ages, but also for advanced users. The Photo Software provides extensive image editing and printing functions for custom made photo albums, photo cards or photo calendars or for the printing of photos in all standard sizes. Also included is a very easy photo collage maker and many batch processing routines for exposure compensation or other recording errors of whole image series or complete image folders or for example to add easily to all your photos a copyright watermark, to prevent theft, if you want to publish your images to the web. • Choose your favorite brush form, size and color or pick the color with the pipette. • Stick the detail sites to one big poster or wallpaper.